By the time when 10 Muslim Pilgrim murdered brutally, including Democracy icon Daw Aung San Suu Kyi, 88 generation leaders and others high profile persons comments and urge to all the people of Myanmar and mostly journalist to be careful to present, act, say and published. It could be turned as a threat to democracy reform. 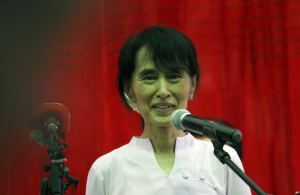 In Daw Aung San Suu Kyi’s speech, she added “every human being want to be safe, respect of a country is the safety and security of its nation and peoples”. And she urged to the government to solve the problem as fast as they can. Or any kind delaying should create another unnecessary problem. But the government constantly delayed as they are doing every time for good cause. 88 generation leader Ko Min Ko Naing had urged extremely not to published any news which can create any kind of unnecessary problem. But the reality is “fools never understand a wise”. Media and public nobody took seriously and they moved faster toward the trap.